In 2008, the downtown landscape of Cincinnati was a whole different experience. After years of planning, The Banks development between Paul Brown Stadium and Great American Ballpark was just breaking ground. Ten years ago this month, Soapbox reported “As the final remains of Riverfront Stadium’s concrete dugout are extracted from the earth, representatives from The Banks development group gave an update to the assembled council-members on what will be known as the first phase between the Freedom Center and Great American Ballpark.” Plans in place for Phase 1-A of The Banks included apartments, retail, and office spaces, with the possibility of a hotel and rumors of a glitzy new 25,000 sq. ft. Kroger store. As part of our continuing Ten Year Anniversary Series, Soapbox explores how The Banks came together; looks at other new recent developments and groundbreakings in the downtown and nearby sectors; and explores what the future holds for development in Cincinnati. 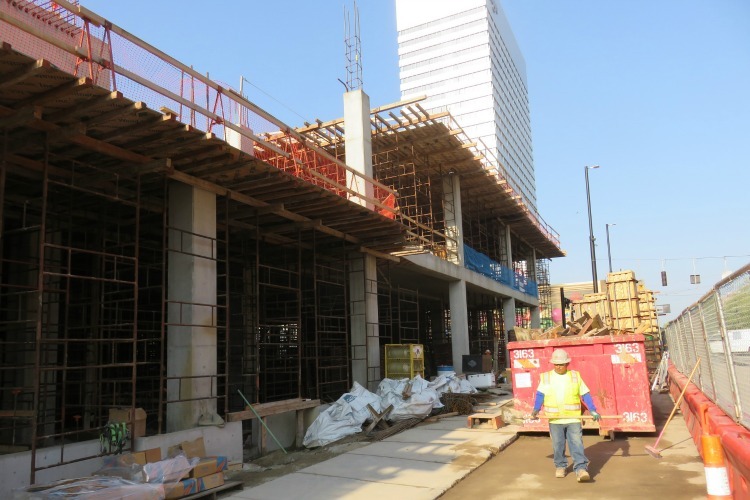 The first phase of The Banks was completed in the summer of 2011 and included Current at the Banks at 121 E. Freedom Way, a mixed-use residential and retail building near Great American Ballpark. Current at the Banks retail occupants now include Joella’s Hot Chicken, Ruth’s Chris Steakhouse, Taste of Belgium, Tin Roof, and Yard House. AC Hotel Cincinnati at the Banks, across from Great American BallparkThe second phase of The Banks included an AC Marriott hotel at 135 Joe Nuxhall Way, which opened in late 2017. Winegardner & Hammons Hotel Group developed the property, which includes 171 guest rooms overlooking the river and downtown cityscape. Chairman Mike Conway explained the appeal of building a hotel at The Banks. “We were interested in The Banks for a number of reasons. We think it’s a great asset to the city. Plus, all that was happening with Smale Riverfront Park including the entertainment, food and beverage, and (the opportunity) to be between the stadiums with a view of the river.” Since their opening in October of last year, the hotel has taken off. “We have been really happy with customer response and feedback and the support we’ve gotten from The Reds, The Bengals, and all of our neighbors at The Banks,” said Conway. The overall development site of The Banks spans 120 acres along Cincinnati’s Central Riverfront, and according to The Banks website, “At full build-out, The Banks will include 1,800 residential space units, 400 hotel rooms, 1 million square feet of office space and more than 400,000 square feet of retail.” The entire project is slated for completion in the next three to five years, and is expected to bring an estimated $1 billion annual impact to the region’s economy. Improvements downtown and in the surrounding districts continue to evolve, with recent major restorations to historic buildings and new housing, hotels, shopping, and parking throughout the corridor. According to the 2017 Future State of Downtown report by Downtown Cincinnati Incorporated, there were $881 million projects currently underway in OTR, Downtown, and Pendleton alone in 2016, and that figure continues to rise. Civic institutions have enjoyed a boom in interest thanks to the ongoing restoration of Union Terminal, slated for completion in fall of 2018, the recent completion of the $143 million Music Hall renovation, a 2016 renovation of Memorial Hall, Cincinnati Shakespeare Company’s new Otto M. Budig Theater and the $6.2 million renovation to The Ensemble Theatre, which was completed in 2017. New housing to the area includes City Club Apartments at 309 Vine Street, which opened in April. A complete remodel of a Neoclassical Revival style building, the location now includes 280 housing units, 45,000 square feet of street-level retail and office space, a rooftop restaurant and bar. 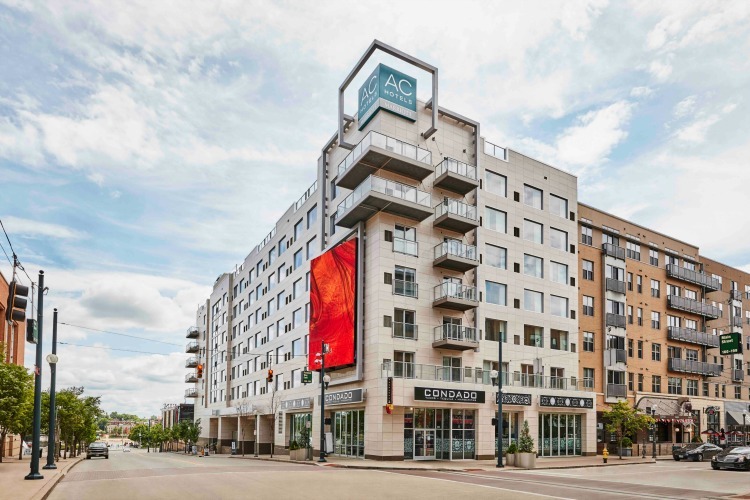 The Encore Apartments at 8th and Sycamore were also completed in 2018, and feature a 131-unit residential tour by North American Properties above a 500-car garage and street level commercial space, developed by 3CDC. Upcoming and current construction includes The Exchange at Sixth Street at 128 and 130 E. Sixth Street, which will feature 60 apartments and mixed-use retail, and River Haus at 501 Main Street in Covington, which broke ground in 2017 and will feature 192 housing units and 3,100 sq. ft. of retail space. Numerous apartment projects are slated for the downtown sector in the coming years, but the long-awaited 14-story luxury apartment tower at the site of the former Pogue garage on Fourth and Race has still yet to break ground. Demolition of the garage is complete, but the vacant site has been empty for a year and a half awaiting development. Project partners 3CDC and Flaherty & Collins Properties both must have financing in place before construction begins, which has held up the project that initially had a 2017 start date. “The project has been a little bit challenging,” said 3CDC spokesman Joe Rudemiller. “We are excited that the financing is now in place.” After getting city council approvals for minor modifications to the plan, “we hope to start construction in the third quarter of 2018,” explained Rudemiller. Court and Walnut shadowed by Kroger Co. headquartersThe retail landscape of downtown will continue to shift in the coming years. For one, the rumors of a new Kroger store that were floating back in 2008 are finally coming to fruition--but not at The Banks. 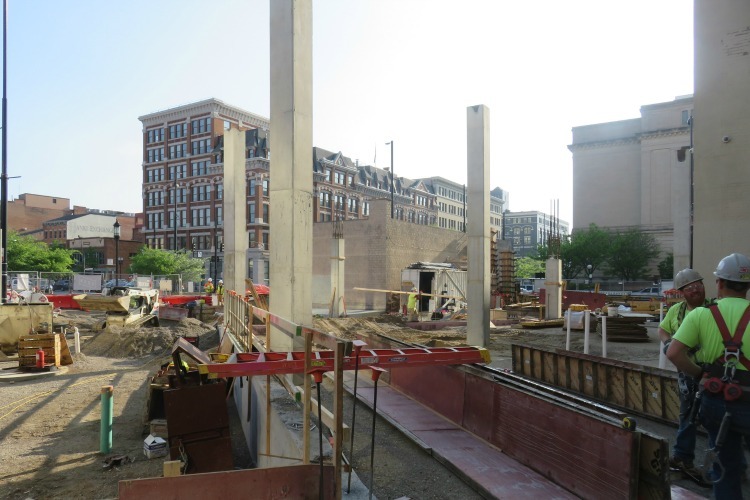 In 2017, Kroger broke ground on a new mixed-use, 18-story tower at the corner of Court and Walnut Streets, with widespread support from city officials. The $90.5 million project is being led by developer 3CDC and when completed it will house a 45,000 sq. ft. Kroger store with beer and wine bar, 139 apartments, and a six-story, 555-space parking garage. “We’re really excited about that project,” said Rudemiller. “This is something that downtown has been clamoring for. We view this as a catalytic project for the Court street corridor.” According to Rudemiller, the new development will bridge the gap between OTR and the central business district, helping to draw the vibrancy and activity of OTR into the downtown area. “We view it as a jumping off point and expect to see more development in that area,” said Rudemiller. Court and Walnut developmentProject partners include Turner Construction and architectural firm GBBN, with North American Properties, NorthPointe Group, and Rookwood Properties serving as developers for the residential portions. The project is expected to be completed in mid-2019. When the store is opened, Kroger will close its Over-the-Rhine location on Vine Street. Despite the future loss of the long-standing Kroger store, new development in the OTR area continues to surge. 3CDC, for instance, is developing Rennen & Beecher Flats at 1505 Race Street and on the corner of 15th and Pleasant Streets, topping off a seven phase mixed-use redevelopment in OTR that has added a lot of new rental housing to the area. “Any given year, we try to bring online twenty to thirty condos in our pipelines, whether those are being sold, for sale or being constructed to keep up with demand,” explained Rudemiller. 3CDC is also currently renovating a slate of historic buildings to serve as office and retail suites including the Behlen building at 15th and Vine streets, Elm Industries at 1537 Race Street, and the Meiners building at the northeast corner of 15th and Vine streets. Dozens more projects, from run-of-the-mill parking garages to the sleek Newport Skywheel with climate-controlled gondolas, await the downtown Cincinnati and Northern Kentucky skyline in the coming years. Check out Soapbox’s recent round-up of Projects to Watch in 2018 for more, and look out for future updates on Cincinnati development in the next State of Downtown report.